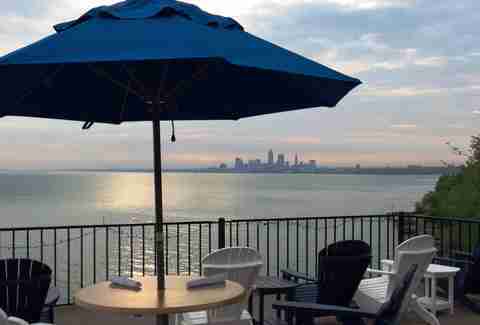 It's a Cleveland tradition: Every year on the first day that the temperature cracks above freezing, we put on shorts and look for the nearest patio. Luckily, you don't have to look far for something a little different. 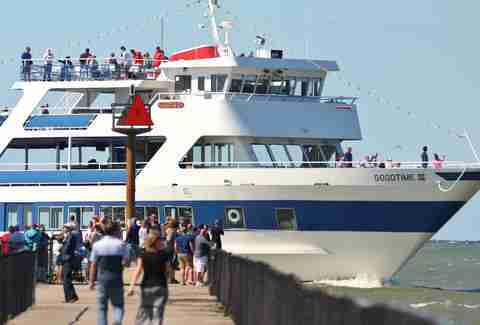 You can watch freighters pass by, dance the night away on a boat, or relax by the lakefront beach. We have plenty of places to eat and drink outdoors, but consider this your bucket list for the art of less-ordinary patio lounging. There’s already plenty that deems Greenhouse Tavern unique. An annual METAL AS FV@K dinner complete with those juicy burgers served on a black bun (\m/) and its whimsical opposite, Wes Anderson Day, in celebration of both Chef Jonathon Sawyer and Anderson's birthday (and there's never a wrong time to toast to Bill Murray). Combine that with a rooftop patio overlooking the brick-lined E 4th St, and you have a bird's eye view of one of the most buzzing districts in the city. It's even hosted rooftop yoga up there. 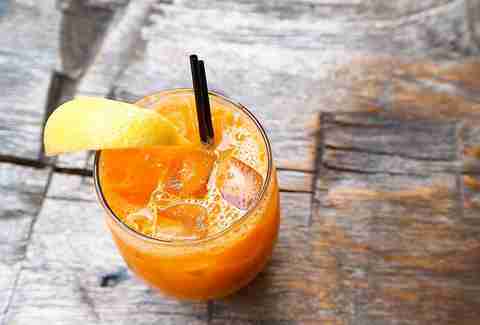 Those who'd rather zen out with a cocktail, animal frites, and roasted pig's head are just as welcome, as always. This upscale Italian restaurant is known for more than some of the freshest house-made pasta in the city. 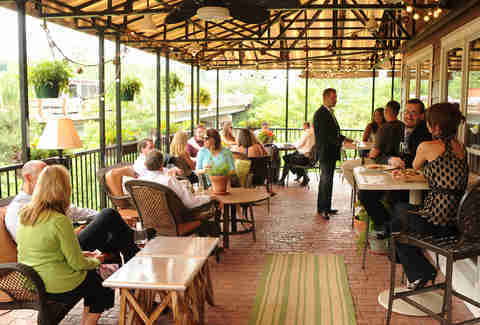 Its wrap-around outdoor patio offers a lush view of the surrounding greenery overlooking the historic Ohio and Erie Canal. Expect everything to be decorated in elegance, excellent service, and a great bottle of wine. You know about the traditional Irish dishes, like shepherd's pie and a smorgasbord of boxty. You know about the live music. But a lesser known hidden gem is the spectacular view from this contemporary Irish pub. 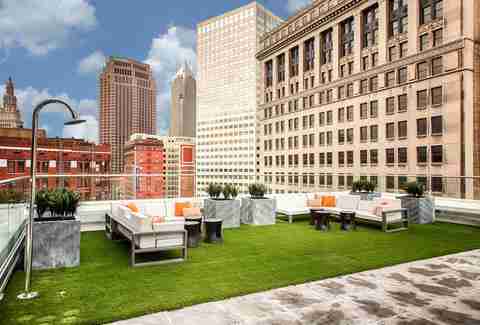 So raise a pint of Guinness and toast to the Cleveland skyline. Everyone's Irish for the day at the Harp. Lucky you. By now you've heard it a million times. The cliffside perspective of the shimmering lake and Downtown precede Pier W's reputation for some of the best fresh seafood in the city, its stellar happy hour, and its indulgent brunch. And who's really surprised by that? The panoramic window views have been stunning guests for more than 50 years. In 2013, Pier W took things one step further and opened their patio for an alfresco experience. That means there's little between you, the lake, and an evening watching a spectacular sunset. The East Bank is a playground these days, and Alley Cat fits in perfectly with the fun. 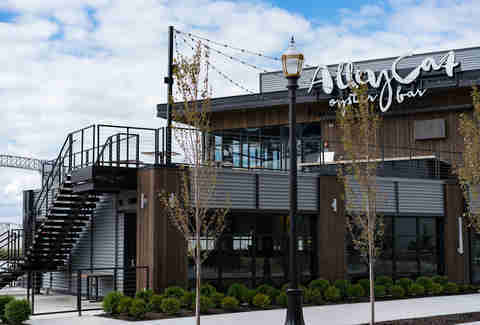 As restauranteur Zack Bruell's most casual concept, it's a destination made for a day of leisurely walking along the boardwalk and a bite to eat. And its industrial-chic aesthetic -- with emphasis on the chic -- is just right for its backdrop. The upstairs outdoor patio is an elevated view of not only the Cuyahoga River, but all the new activity cropping up around it. Slurp up a few oysters waterside and you might just be inspired to hit the pool party at FWD Day + Nightclub. This place is pure romance, down to the rich pasta and bottles upon bottles of wine. So after sharing all the small talk, flirtations, and glasses of vino, a stroll along the Superior Viaduct is all the dessert you'll need. So fear not if you can't take a seat on the patio -- the interior is lavishly decorated with works of art. But if you do nab a seat outdoors, you'll look out against the brightly lit skyline. But closer to dark is where the stunning views are brought into focus. On the right night, you'll even be serenaded by the sounds of whatever act is passing through Nautica Pavilion spilling over to your table. Two words: beach volleyball. 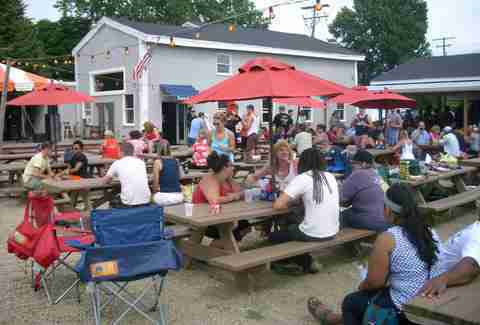 Sure, the fare at this marina ain't fancy, but you're not necessarily there for the food. 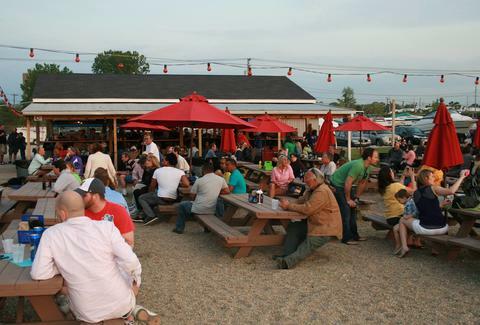 You're there for a place where everyone can gather around the picnic tables, throw back some summery ales, and relish what we have left of those warm summer days. Though this little slice of secluded paradise may seem a bit hidden to the unacquainted, when the bands start playing, the games get going, and the boats hit the waves, it's one of the liveliest places to waste away the afternoon in the sun. 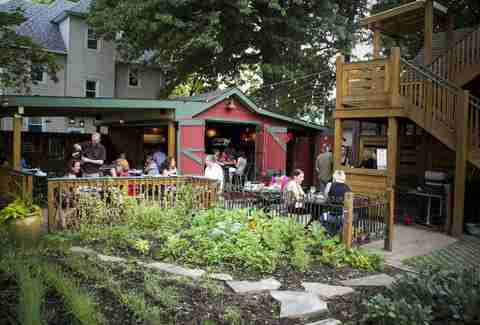 This Cleveland Metroparks-run restaurant is tucked into one of the most Cleveland corners of the city. The waterfront views are a tranquil sight, of course, but you're also right next to the Crooked River Skatepark, where the half-pipe comes alive under the bridge. To your other side is Hart Crane Memorial Park, where sculptures honor the late Northeast Ohio-born poet. And when you're ready for an after-dinner drink, just head down the street to craft brewery Brick and Barrel. 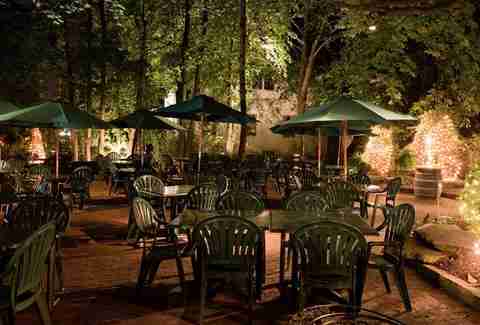 Soak up the rays on Merwin's patio in the summer and cozy up by the fire pits come fall. Sometimes patio day drinking just won't do. Luckily, when you fuse our waterfront with cruise ships like Nautica Queen and the Goodtime III, your problem is solved. The quadruple-deck Goodtime III hosts voyages from lunch-time jaunts to -- we're inclined to recommend -- a Friday Dance Cruise. The morning after a dance cruise, hop right back on board with the Nautica Queen's bottomless brunch. Surprise! There's. Even. More. Dancing. DJs and never-ending waffles is a combination we can get behind. And after two nights of maritime soirees, your palate will be cleansed for returning to another landlocked Sunday Funday on the patio of your neighborhood pub. Nestled away near Cuyahoga Valley National Park, this quaint escape is the perfect stop to recharge after a day of hiking. Out on the patio, you'll be right up against the rocks splashed by the rushing creek. The food is as colorful and comforting, a fitting match for the friendly service. 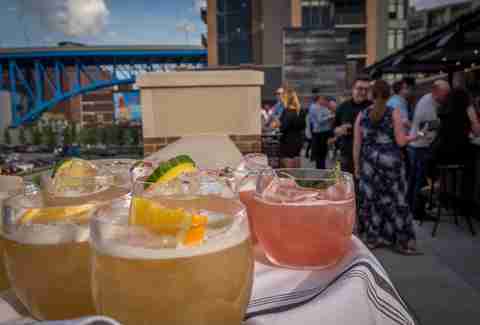 Easily one of the most anticipated openings of the summer, Punch Bowl Social’s new rooftop patio is sure to attract a lively crowd for craft beverages, light bites, and general debauchery all season long. On rainy days and cooler nights, a multitude of indoor activities (including bowling, karaoke, and arcade and table games), as well as a full-service restaurant, are guaranteed to keep groups of any age entertained for hours. As the name suggests, handcrafted bowls of spiked punch, served in charming vintage glassware, are not to be missed. Although we enjoy Luxe’s eclectic, Mediterranean menu all year round, it’s best enjoyed on the restaurant’s patio during the warmer months. The outdoor space’s casually hip vibe is exactly what you’d expect to find tucked away in the blossoming Gordon Square neighborhood. And humans aren’t the only ones able to get in on the action, either, as Luxe’s Bow Wow Brunch kicks off Memorial Day Weekend, giving diners the perfect excuse to hang out with their dogs every Sunday Funday (as if you needed one). Let’s face it: Strongsville is pretty damn congested these days. Take a step back in time to when the area was more quietly suburban by paying a visit to the Pomeroy House’s serene patio. If there’s anything more relaxing than sipping a cool glass of wine underneath shimmering rows of twinkle lights, we have yet to find it. On busier nights when there’s a wait for a patio table, descend the stairs to the restaurant’s casual basement pub where you can enjoy a quick drink before the main event. Situated in a historic bungalow, Felice‘s hopping outdoor patio is absolutely as charming as the old home’s exterior suggests. Featuring a diverse and playful menu, including plenty of veggie options such as truffled soft polenta and kofta tacos, a summer night on Felice’s patio can be as casual or as fancy as you want. Don’t miss out on the cocktails, either, like the black walnut Manhattan. We’ll take several, thanks. If Georgetown's courtyard patio looks good enough to double as a wedding venue, that's because it often does. When it’s not being used to join two lovers in holy matrimony, though, diners can enjoy the cobblestones and glittering twinkle lights for themselves over dinner -- or better yet, a truly excellent weeknight happy hour. Do NOT skip the Maine lobster pizza, because it's just as delightfully decadent as it sounds. Nikki Delamotte is a Cleveland-based freelance writer whose idea of a successful weekend is one spent on a cruise ship's dancefloor. Follow her patio adventures on Twitter at @nikkidelamotte. Beth Phillips Synk is a Cleveland-area writer who would like nothing more than to spend her entire summer on a patio with a glass of wine in one hand and a book in the other. You can follow her on Twitter @CraveableCLE.